Surfing is a notoriously tough sport to learn, and dealing with big crowds and hopped-up locals doesn’t make standing up any easier. 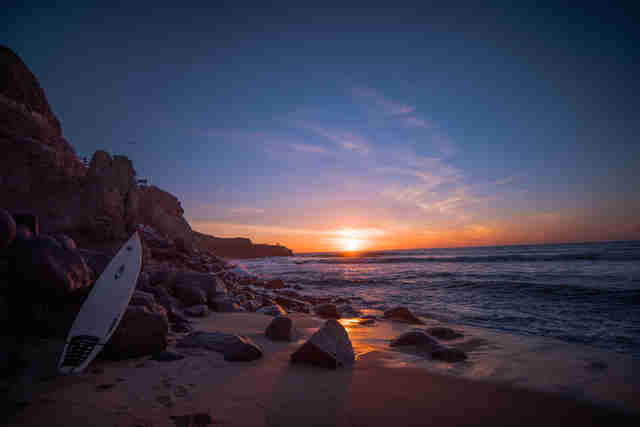 Luckily for San Diegans, with a little effort, you can almost always find a mellow surf spot that isn’t overrun with 12-year-old surfing prodigies and semi-professionals without day jobs. 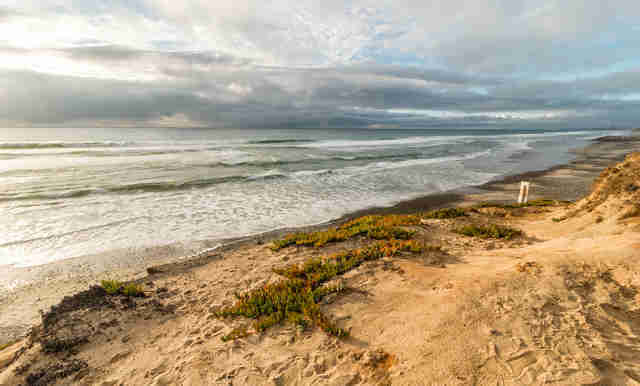 Here's a handful of beaches that don’t get the credit -- or the crowds -- that they deserve. How to get there: Park on Carlsbad Blvd near Cerezo Dr or in the surrounding neighborhoods, and follow the staircase north of Cerezo down to the beach. 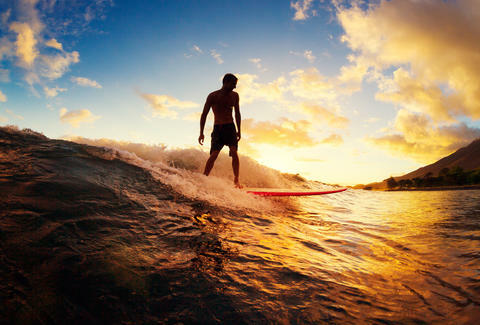 Terramar is home to a mellow wave, making it a popular longboarding spot. It’s not overrun by hot-headed locals, so it’s a good place for beginners to go without the fear of getting chewed out. There's also a nice channel to paddle out into, so it’s easier to get into the lineup compared to the surrounding beach breaks. How to get there: Ponto is part of South Carlsbad State Beach, so there's a paid parking lot north of the intersection at La Costa Ave and Carlsbad Blvd. Free street parking is available on the southbound highway lanes or in the dirt parking lots along Avenida Encinas. 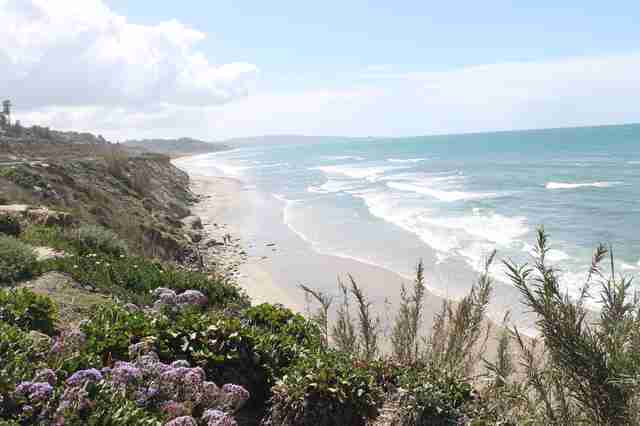 Ponto is a beach break. It isn’t as clean as other surf spots in the surrounding area, but that doesn’t mean it isn’t just as good or better. 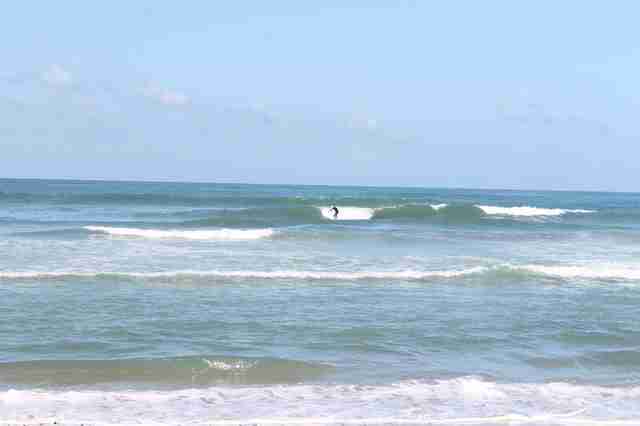 It consistently has decent surf and lots of waves. Plus, more paddling means sexier arms! The beach has bathrooms and lots of parking in the area, so it’s just as good a place to spend the day as it is to surf for a few hours. How to get there: The break is just south of the traffic light at Las Olas Mexican restaurant; parking is available on the Pacific Coast Highway. George’s really doesn’t get the love it deserves among North County surfers. 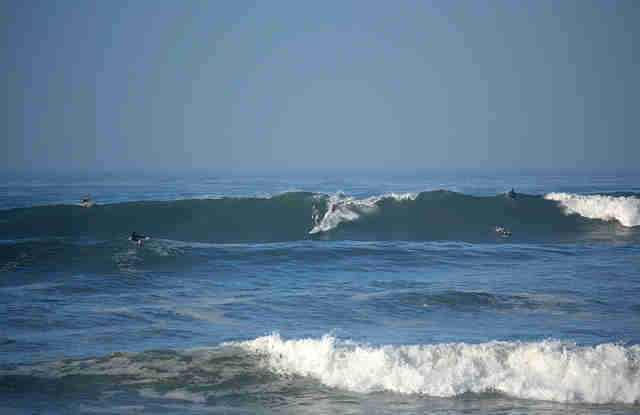 There's hardly ever a crowd, since most people tend to congregate north at Cardiff Reef or any of the breaks near Pipes. The surf does have its fair share of closeouts, and it isn’t exactly beginner-friendly, but it’s definitely a place to check out when you want some solitude. How to get there: Crossing the railroad tracks is illegal, and we do not, could not, and would not condone lawbreaking of any kind. That being said, surfers generally park in the neighborhoods around 8th Street and head west, crossing the tracks, and finding one of the trails headed down the bluff. It’s a little hairy getting down, so proceed with caution. When the surf is bigger, 8th Street holds it really nicely and is a significantly less-crowded alternative to 15th Street. It’s at the bottom of a high bluff, so it’s a bit of a trek, but the view alone is worth the risk. If you want to make your out-of-town friends jealous, Snapchat them from the top of said bluff. How to get there: Head west on Tourmaline St off La Jolla Blvd until you hit the parking lot, and you’re there. Tourmaline is a beginner break that has a little bit of a reef. It’s easy to find and access, which also means there is often a crowd. The surfers here aren’t as aggressive as they are at New Break, or "Nubes," to the south, which makes for a much more pleasant lineup. Tourmaline is another great place to spend the day, thanks to the welcome presence of bathrooms. How to get there: Head south on Cable St until it ends (past where it intersects with Orchard Ave). There's a boat launch, and that’s where you paddle out. You're relegated to street parking. 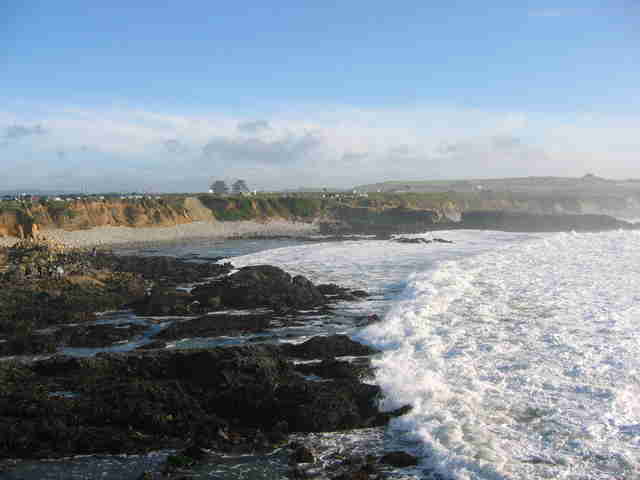 Pescadero is one of the few places in the summer that still gets surf. It’s usually not super crowded, although part of the reason is because strong rip currents and the exposed reef make it a little more dangerous than most breaks. How to get there: Park in the lot at Ladera St and Cornish Dr and follow the worn path down the cliff, which follows the drainage pipe. 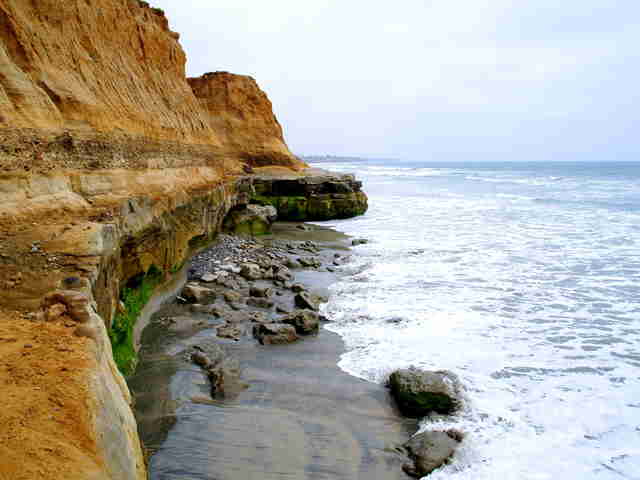 There is a rope that helps people down the steep bluff, so make the walk carefully. There's also a staircase north of the parking lot, but that's way less fun than rappelling via the rope. Garbage is perhaps the toughest place on here to get to, but it’s also one of the most scenic. 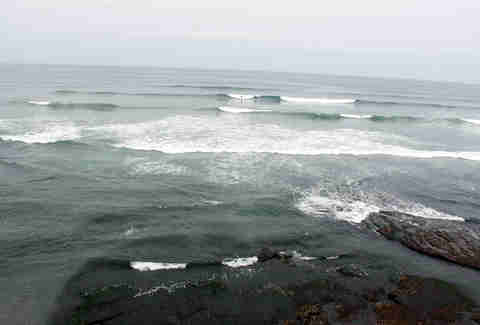 It’s slightly protected by the kelp beds, so wind isn’t a major issue, and a nice channel makes for an easy paddle-out. It’s not that great on smaller days when there's some swell -- it draws a crowd quickly. As for the name? Very misleading, unless you count the hippie trash all over the bluffs. Ellen Wright is a freelancer at Thrillist who grew up surfing North County and hates a paddle battle as much as the next guy. Tweet her the beaches she missed: @PacificPolished.